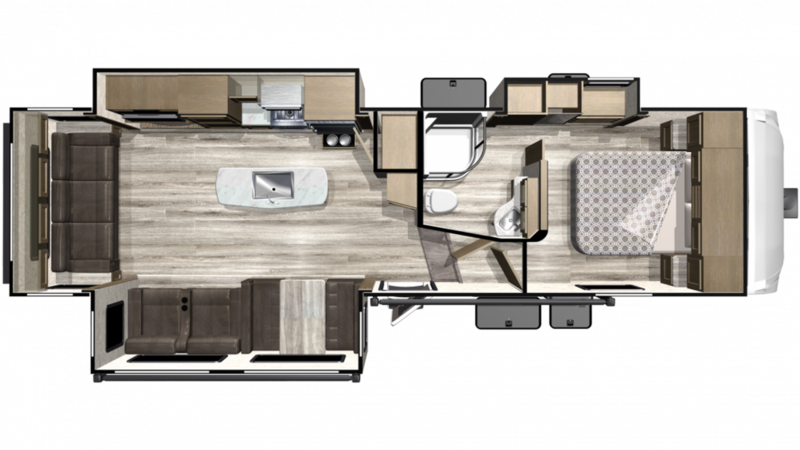 Stop by RV World MI to bring this amazing 2019 Starcraft Telluride 292RLS home! Find this 5th Wheel and other exceptional RVs when you visit us at 7834 S Division Grand Rapids Michigan 49548! Call us at 616-591-3632 to talk to one of our RV experts today! You'll love the dimensions of this great 5th Wheel! It's 31' 11" long, 8' 0" wide, and has a sturdy GVWR of 9995 lbs! The hitch weight of 1485 lbs, ship weight of 7995 lbs, and 3 flush mount slides make it easy to tow and go! When you reach your destination, set up is easy, and the 9' 0" patio awning means your family will enjoy outdoor living in shade and comfort! There's so much space inside this 8' 0" wide, 31' 11" long RV, and it's even roomier when you slide out the 3 slides! With its height of 12' 3", you won't have to worry about bumping your head! The living area maintains a stable temperature with the 18000 BTU furnace and the 15000 BTU a/c! Enjoy a long night's sleep on the Queen bed inside the master bedroom! A family of up to 6 can sleep well inside! If you've been missing healthy, home cooked meals on the road, then you're in for a treat when you travel in the Telluride 292RLS! It has a roomy, full kitchen that includes a 3 burner range, 8.00 cu. ft. refrigerator, and more! Clean up's a breeze with plenty of hot water from the 51 gal. freshwater tank and 40 lbs. of LP tank capacity!